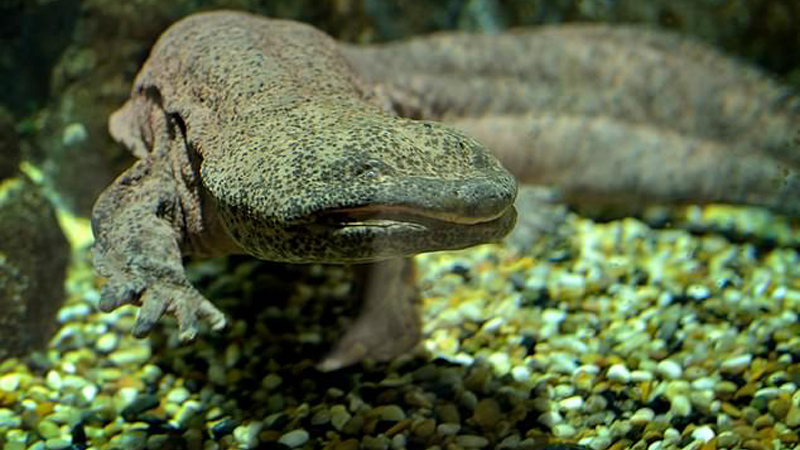 Among those now threatened is the Chinese giant salamander, an Asian delicacy and anatomical marvel that can grow up to six feet long and is one of only three living species in an amphibian family that can be traced back 170 million years. Some of the world's biggest animals are at risk of extinction because of the unquenchable thirst humans have for meat. A study found at least 200 of Earth's largest creatures are decreasing dramatically and more than 150 face being killed off completely, according to scientists. Of these large animals, known as megafauna, 70 per cent are in decline and 59 per cent are at risk of disappearing from the globe. Nine megafauna species have either gone extinct overall - or in the wild - in the past 250 years. 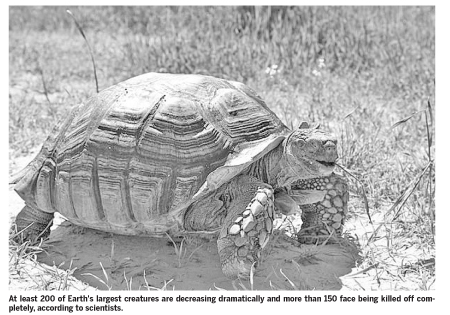 These include two species of giant tortoise - one of which disappeared in 2012 - and two of deer. This animal is now under siege by hunting, development and pollution and experts predict it to become extinct in the wild imminently. Professor Ripple said: “Preserving the remaining megafauna is going to be difficult and complicated. “There will be economic arguments against it - as well as cultural and social obstacles. “But if we don't consider, critique and adjust our behaviours, our heightened abilities as hunters may lead us to consume much of the last of the Earth's megafauna.” Mammals and fish weighting at least 100 kilos (220 lbs) and amphibians, birds and reptiles tipping the scales at a minimum of 40 kgs (88 lbs) were considered to be megafauna. Larger animals tend to have longer lifespans, longer gestation periods, and longer before reaching sexual maturity and dependence on previous generations. This slows down the rate of reproduction and generations take decades, not days as with some insects. This makes adaptation via evolution a slow and ill-fated process for species hoping to avoid extinction. Over the past 500 years humans’ ability to kill these animals at a safe distance has become highly refined. 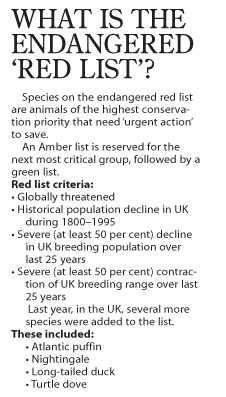 This has coincided with two percent of megafauna species going extinct. The study, published in the journal Conservation Letters, analysed almost 300 species of ‘megafauna’ - big animals such as elephants, giraffes, whales, cows, deer and tigers. Professor Ripple said: “Direct harvest for human consumption of meat or body parts is the biggest danger to nearly all of the large species with threat data available. Throughout our entire history, humans and other hominins have selectively killed off the largest mammals.